To get the most out of your copy of 3D Weather Globe & Atlas, download the latest version. If you are having a technical problem, installing the latest update will often solve it. 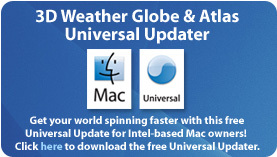 If you have 3D Weather Globe & Atlas version 1.1, you can download an update to version 1.1.1 that adds a few features and compatibility with the Apple's Mighty Mouse. To get the update, click here. It's FREE! This update provides compatibility with Mac OS X 10.4 "Tiger" for the 3D Weather Globe & Atlas that came pre-installed on certain iMacs, iBooks and eMacs as part of the 2005 World Book Reference Suite. Click here to download. It's FREE! Many of you have requested that your own city or town be added to our database and we agree! This update adds all the city requests we've received so far. Click here to download. It's FREE!